Some of the most interesting hypnosis research of recent years has examined the efects of hypnosis and suggestion upon attentional control. Attentional skills are closely related to hypnosis, and a number of models have proposed that differences in executive attentional control account for individual differences in hypnotic susceptibility (see Theories). For example Gruzelier's (1998) neurophysiological model of hypnosis proposes that selective attention must be engaged in order for a subject to focus upon the first stages of a hypnotic induction, and that this selective attention is more effective in high susceptible subjects than in lows. Some traditional views of hypnosis contend that the hypnotic 'state' is characterised by strongly focussed attention (see Jamieson & Sheehan, 2002). Other models have proposed that high hypnotisables efficiently focus attention while unhypnotised (Kallio et al, 2001), but that their attentional control is compromised following a hypnotic induction (Gruzeler, 1990; Crawford & Gruzeler, 1992; Woody & Bowers, 1994; Kaiser et al, 1997). These theories of hypnosis, and the instrisic studies which test them, are covered in more detail in a separate section. Instrumental studies: How does hypnosis control attention? Cognitive processes can be categories as controlled or automatic (Schiffrin & Schneider, 1977). An example of a c controlled process might include watching for a kettle to boil before making a cup of tea. An automatic process might include being distracted from a task when you hear your name being called. Some are thought to be innately automatic, others become automatic through practice (Spelke, Hirst & Neisser, 1976). Once automatc, these processes are initiated unintentionally and cannot be prevented or stopped (Raz et al, 2006). Studies using hypnotic (and non-hypnotic) suggestion to try to affect this automatic processing are important: firstly because they demonstrate a genuine effect which would be difficult for participants to deliberately achieve (read the section on demand characteristics), and secondly because they illuminate how suggestion can be used to alter cognitive processes (which might also be useful clinically). One example of automatic processing which is widely used in Psychology is the Stroop task (Stroop, 1935). In this task names of colours are presented to subjects in different coloured inks. Participants must name the ink colour of a colour word while ignoring the meaning of the word. To perform the task subjects need to select the relevant information (ink colour) and suppress irrelevant information (meaning of the word). Try it for yourself. Out loud & as fast as you can, say the names of the ink colour of each of the words below. Notice which row is most difficult. The incongruent row was most difficult wasn't it? The Stroop task provides evidence for the automaticity of reading. Despite explicit instructions only to attend to the ink colour, a proficient reader cannot withold accessing word meaning. Participants are usually slower and less accurate in identifying colour words printed in an incongruent compared to a congruent ink. The Stroop Interference Effect (SIE) is defined as the difference in responses to congruent and incongruent stimuli. Two accounts are classically used to explain the Stroop effect. One, the relative speed of processing hypothesis suggests that word reading is faster than colour naming. A second hypothesis suggests that word reading interferes with the more effortful, ateention-demanding process of colour naming. Very soon you will be playing the computer game [the Stroop task]. When I clap my hands, meaningless symbols will appear in the middle of the screen. They will feel like characters of a foreign language that you do no know, and you will not attempt to attribute any meaning to them. This gibberish will be printed in one of 4 ink colours: red, blue, green or yellow. Although you will only be able to attend to the symbols ink colour, you will look straight at the scrambled signs and crisply see all of them. Your job is to quickly and accurately depress the key that corresponds to the ink colour shown. You will find that you can play this game easily and effortlessly. The post-hypnotic suggestion had very little effect in the low suggestible participants. However, in the high suggestibles there was a marked effect of suggestion, and it was particularly pronounced in the incongruent condition: with the suggestion absent there was large interference and it took participants considerable time to name the colours, but with the suggestion present this interference was removed. The authors conclude that effective posthypnotic suggestion operates through a top-down mechanism which modifies the processing of input words - and that this modulation is not voluntarily available. Following this first experiment Raz and colleagues also carried out the study using functional magnetic resonance imaging (fMRI) and electrical scalp recordings (ERPs) (Raz et al, 2005). The Stroop interference effect was removed during ERP sessions and reduced in fMRI sessions. 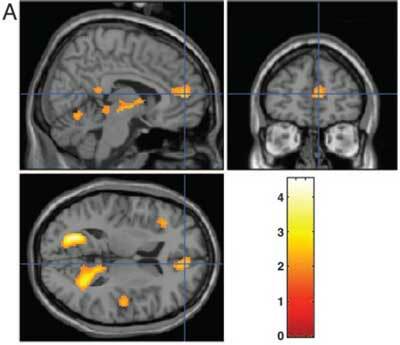 Figure A, below, shows an area of the anterior cingulate cortex (ACC - crosshairs) which showed reduced conflict-related activity when the posthypnotic suggestion was present. 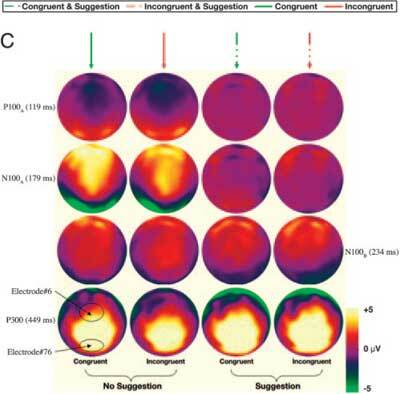 Figure C shows an average of electrical brain activity during the key conditions of the experiment - when posthypnotic suggestion was present or absent, and when participants were completing congruent or incongruent trials. The two right-most columns show brain activity when the posthypnotic suggestion was present - when the participants were viewing the words as 'nonsense' or 'gibberish'. It can be seen that activity at the back of the brain in the occipital cortex, an area which processes visual information, is significantly different when the posthypnotic suggestion is present. The authors conclude that the posthypnotic suggestion altered early visual cortex activity, which in turn led to reduced 'conflict' activity in the ACC. Figure: Data from Raz et al (2005). Figures reprinted with permission from PNAS. The participant's task is to identify the target as quickly and accurately as possible, by pressing one of two keys (e.g. T or F). Participants need to select the relevant information (the target) and inhibit the surrounding information (the flankers) in order to make the correct response. By comparing response times for the different conditions it is possible to assess the effect of irrelevant information. Reaction times are typically faster for congruent as compared to incongruent trials, and the implication is that completely irrelevant stimuli are not completely excluded from processing, even though this would be desirable. Very soon you will be in front of the computer screen, ready to play a computer game [the Flanker task]. Some letters will appear in the middle of the screen. Your gaze will be captured, like a magnet, by the central letter. Your attention will be completely absorbed by the central letter, which will appear as very bright. Any other letters will appear as blurred, less luminous, and further away from the central letter. These letters are irrelevant. You will be able to attend to the central letter only and to respond to it. Your job is to quickly and accurately depress the key that corresponds to the central letter. Very soon you will be in front of the computer screen, ready to play a computer game. Three letters will appear in the middle of the screen. Your job is to quickly and accurately depress the key that corresponds to the central letter, ignoring the letters on the side. It is very important that you try to ignore the side letters, because they are irrelevant and can easily induce you to respond incorrectly. Your attention should be completely absorbed by the central letter. To help better focus your attention on the central letter, you may try to imagine it as bigger and brighter than the others, which should instead appear as blurred, less luminous, and further away from the central letter than they are. In experiment 1 responses were generally slower in the post-hypnotic suggestion condition. However, whereas the low suggestible participants performed signficantly worse in the incongruent condition, regardless of whether they had been given a suggestion, the high suggestible group only differed significantly in the naturally altert condition. In other words, the post-hypnotic suggestion led to a significant reduction of the interference effect in the high susceptible participants. In experiment 2, where only high suggestibles were tested, it was found that subjects reaction times were significantly higher in the incongruent condition. The authors interpret this as showing that suggestion alone is insufficient to remove the interference. However, this conclusion may be premature. In experiment one, 3 participants were excluded from the analysis because they did not comply with the post-hypnotic suggestion, and compliance in the second experiment is not reported. Additionally, in the Stroop study by Raz and colleagues (2006) non-hypnotic suggestion was found to at least partially remove the Stroop effect, indicating that it is not necessarily the hypnosis, but rather suggestion, which affects performance on such conflict tasks.